Friday, 22nd June 2012. The FBM KLCI ended slightly lower while regional index finished mostly lower except Nikkei. Other new to follow. "-U.S. stocks on Thursday took their second hardest knock so far this year as economic reports indicating a slowdown in global manufacturing increased investor anxiety. Data illustrating a slowdown in euro-area manufacturing and Chinese output also contracting pummeled commodities, with oil falling below $80 a barrel gold prices below $1,600 an ounce. The Dow Jones Industrial Average DJIA -1.96% retreated 250.82 points, or 2%, to 12,573.57. The S&P 500 Index SPX -2.23% fell 30.18 points, or 2.2%, to 1,325.51, with energy shares the heaviest drag and utilities the strongest performer among its 10 industry sectors. Goldman Sachs advised clients to short the S&P 500 on Thursday. The Nasdaq Composite COMP -2.44% fell 71.36 points, or 2.4%, to 2,859.09." "-Most Asian markets fell Thursday after data showing a further cooling in Chinese manufacturing activity and as investors hoping for major new Federal Reserve stimulus were disappointed, although Japanese stocks rose on a weakened yen. China’s Shanghai Composite CN:000001 -1.40% dropped 1.6% and South Korea’s KospiKR:SEU -0.79% lost 1.1%, while Hong Kong’s Hang Seng Index HK:HSI -1.30% and Australia’s S&P/ASX 200 index AU:XJO -1.08% each declined 0.9%. Japan’s Nikkei Stock Average JP:100000018 +0.82% , however, gained 0.9%. Stocks mostly extended losses after an initial reading of HSBC’s China manufacturing Purchasing Managers’ Index showed activity slowing in June from the previous month." "- Crude-oil futures fell Thursday, ending below $80 a barrel and on their sharpest decline since December as weak global economic data kept fears of less demand for oil in the forefront. Natural-gas futures advanced, as a weekly U.S. supply report for the fuel came in within expectations. Crude for August delivery CLQ2 +0.41% retreated $3.25, or 4%, to settle at $78.20 a barrel on the New York Mercantile Exchange, its lowest since early October." 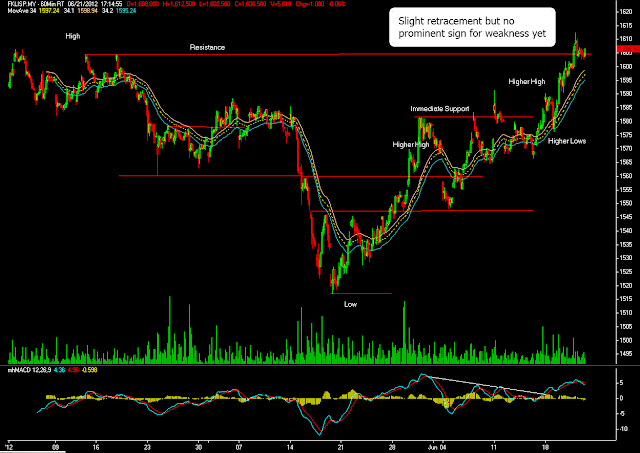 "-August Soybeans finished down 14 at 1423, 20 1/4 off the high and 1 1/2 up from the low. November Soybeans closed down 24 1/4 at 1371 1/4. This was 1/4 up from the low and 23 off the high. August Soymeal closed down 1.5 at 422.6. This was 1.9 up from the low and 8.6 off the high. August Soybean Oil finished down 0.9 at 50.1, 0.82 off the high and 0.17 up from the low. Soybeans were trading sharply lower on the day late in the session with July soybeans down 5 cents while November were down 22. November soybeans failed to move above yesterday's highs which likely triggered profit taking after moving 75 cents higher since Monday. Into the closing bell, a bearish tilt to gold, the dollar and energy markets plus more rain concerns helped to spark a sharp break in November soybeans. December soybean meal traded 3.50 dollars lower while December soybean oil was down 95 late in the day. Export sales released this morning were considered negative with net weekly export sales at 163,800 metric tonnes for the current marketing year and 444,200 for the next marketing year for a total of 608,000. As of June 14th, cumulative soybean sales stand at 101.7% of the USDA forecast for 2011/2012 (current) marketing year versus a 5 year average of 98.9%. Total net meal sales came in at 282,000 metric tonnes while total net oil sales came in at 20,400 metric tonnes." Stock index and index futures retrace marginally after both of the instruments rose to record high on previous Wednesday. Words out that economy data on manufacturing activities on China is slowing down and the figures on U.S housing sales is expected to deteriorate slightly. All this concern will serve as main headlines for current market sentiment. On technical perspective, the Bullish momentum on stock index and index futures are far from fading at the moment as there is yet any sign of correction yet. Both market is still susceptible to rally further even though it had been overbought for a few sessions. If anything should go wrong such as major pull back on U.S stock index, the exponential moving average shown above might be a great area for determining market support level. 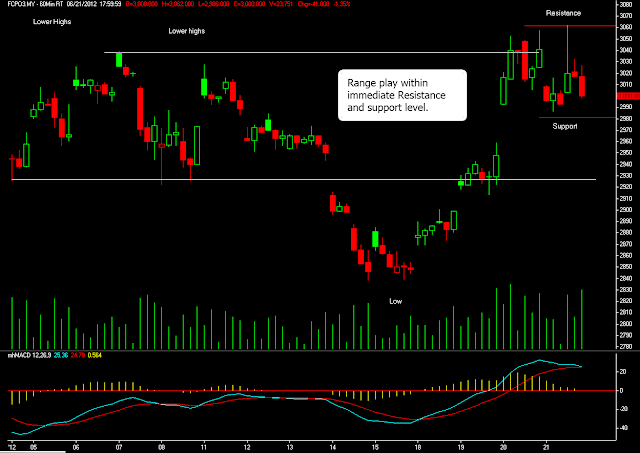 For today, pivot support is located around 1,597 while resistance is pegged at 1,617. FCPO- Market Dived Into Sideways Market After Recovering Three Day Ago. CPO futures ended RM41 lower to 3,000 level after it recovered to 3,062 level yesterday. It was a over volatile sessions yesterday when market quickly surged up to 3,062 level after resuming on afternoon session which might due to flash recovery on Soya oil during that time. The most actively traded Soy oil was recorded lower 0.54 cents lower to 50.27 cent per pound on 6.20PM +8GMT. Technically, we are likely looking at range bound trading session today (unless there is any major correction occur on overnight Soy oil) with immediate resistance located around 3,062 level while support located around 2,980 level. In order to gauge how strong on this recovery, market need to correct and rally above the immediate resistance subsequently after that. Else we are likely to see this particular recovery to be short live if it continue to head south after it breach the immediate support trend line shown on hourly chart above. For today, pivot support level is located around 2,940 if the market manage to breach below 2,980 area, while resistance is pegged at 3,046.